The Flemish Astronomer Michel Florent van Langren actually named Langrenus after himself, and somehow, the name has stuck. Langrenus is a prominent impact crater located near the eastern limb of the Moon. Like all impact craters, it is circular, but appears oblong due to foreshortening. You can spot it along the eastern shore the Mare Fecunditatis. The terraced inner wall of Langrenus has an average width of about 20 kilometers. The outer ramparts are extensive and hilly, and you can see a rays of ejecta extending outward across the darker mare to the west. The interior of the crater has a higher albedo than its surroundings, and so it stands out when the Sun is high overhead. The northwest floor of the crater is rougher compared to the southeast. The central peaks rise about a kilometer above the floor. 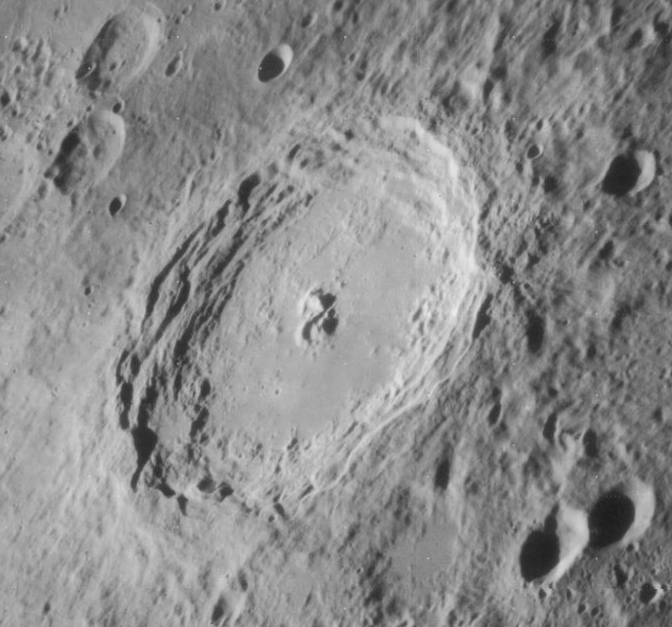 Proclus is a very bright crater just west of Mare Crisium. Its bright rays radiate in mostly 3 directions. To its west is Palus Somni—the Marsh of Sleep. Mare Crisium is distinctly seperated from all of the other maria on the near side of the Moon, making it easy to distinguish. This round feature on the Moon is nearing the eastern limb, and so, is severly foreshortened—meaning, we are not looking at it straigh on, but at an angle. Sunlight can reflect off of the Earth and onto the Moon. While the Moon is a crescent in the Earth’s sky, the Earth is a bright gibbous in the Moon’s sky. All that sunlight reflecting off of the Earth shines brightly on the Moon, causing the dark part of a cresecent moon to be bright enough that you can just about identify the maria on its surface. Also known as a twilight zone, a terminator is where the shadow of night and the light of day come to meet on a planetary body. At the edge of where the Sun’s light reaches, the terminator is constantly moving as the Moon rotates. When observing the Moon, many features are best observed when they are near the terminator, where shadows are long and plentiful. The shadows provide higher contrast between surface features. 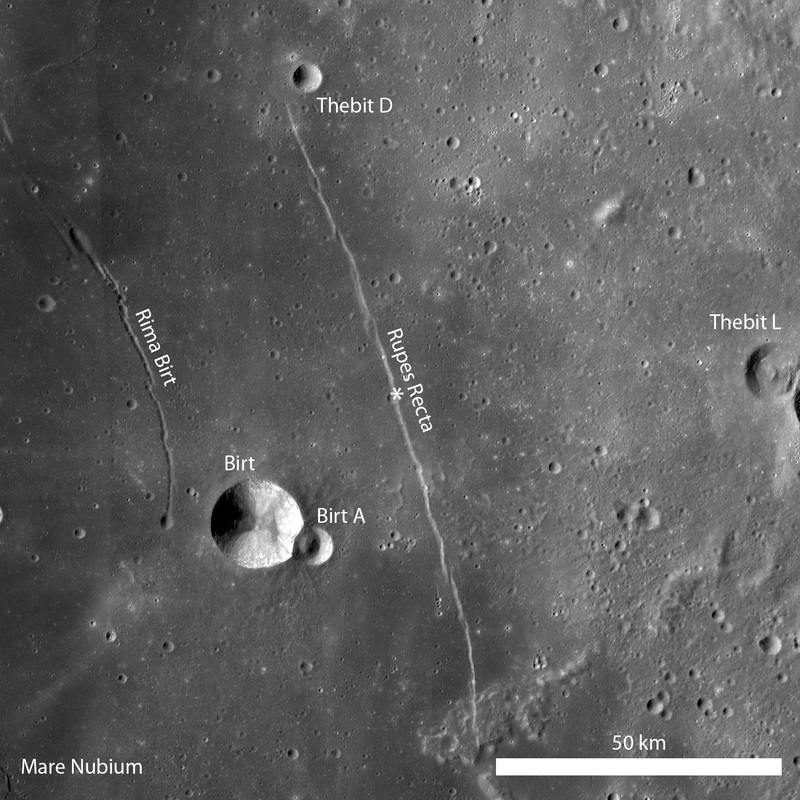 Also known as the Straight Wall, Rupes Recta is actually a 100 km long incline along a fault. This kind of feature is known as a linear rille, or graben, and forms as the lunar crust is pulled apart. Though it looks like one continuous fault from Earth, Rupes Recta is actually a series of at least 5 segments, ranging from about 8 to about 50 km in length, each 1-3 km in width.